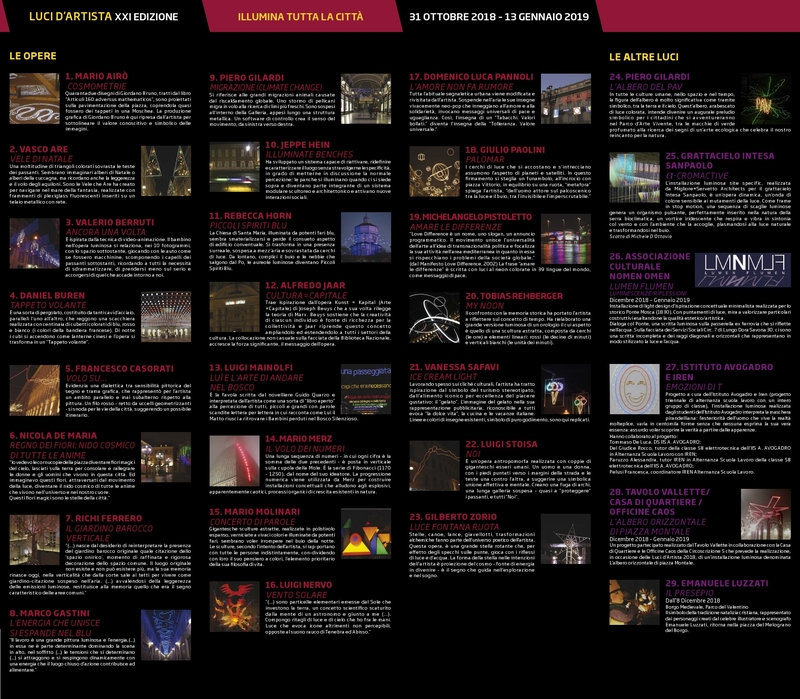 The City of Turin has launched the 21st edition of its Luci d’Artista festival, taking place from 31st October to 13 January 2019. This edition features 23 contemporary artworks: 13 in the city centre and 10 in the other 7 districts of the city. Out of these, six artworks are permanent and always operational. 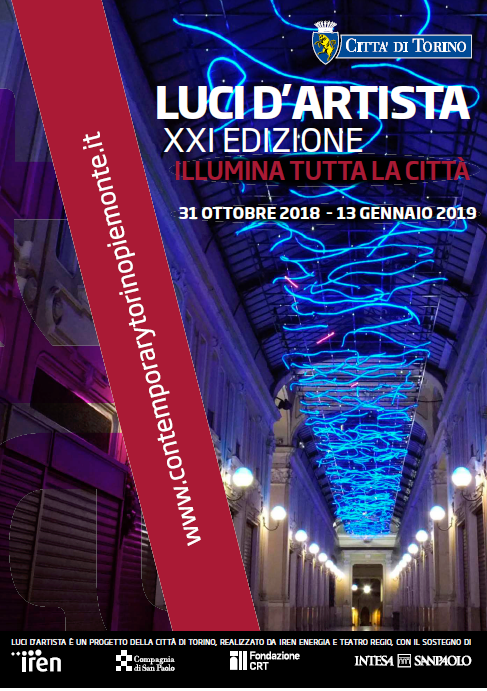 Luci d’Artista offers citizens and tourists new artworks thanks to the creative contribution of internationally renowned artists who have realized over time a significant heritage of luminous works. The event was conceived in 1997 with the aim of bringing art out of institutional spaces. Over the years, Luci d’Artista has allowed everyone (not just contemporary art experts) to enjoy the work of internationally renowned masters. The luminous works have become an opportunity for dialogue between the contemporary art system and the general public. By bringing the collection into the urban fabric, a wider use of the artworks is achieved, and people relate with more familiarity. 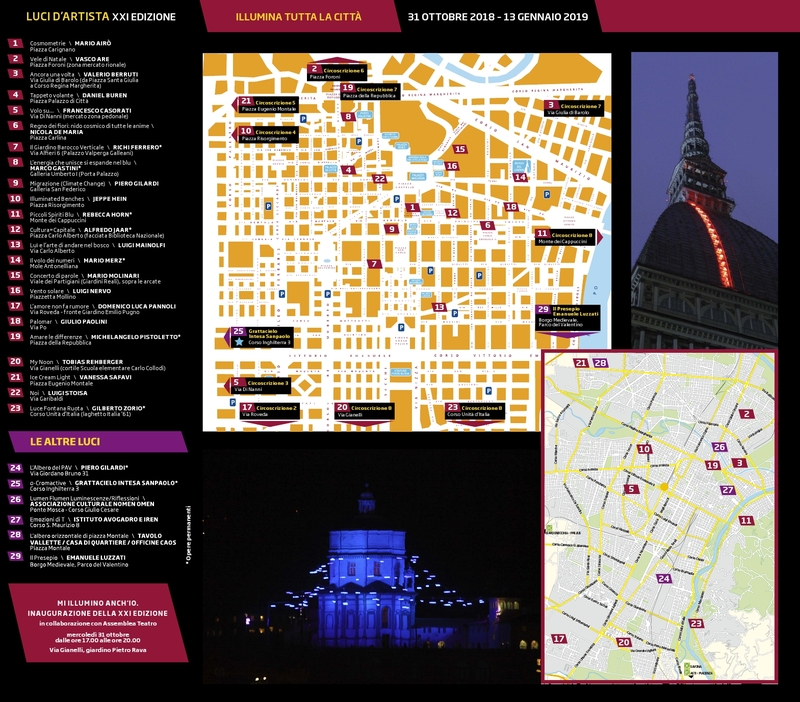 The City of Torino, which is the owner of all the lightning artworks and plans their position annually: this is a cultural heritage that grows year by year. The event is organised by the City of Torino with technical partner IREN (the city’s electric power management company that will ensure reduced consumption using 400 000, mainly LED, light sources connected by 8 km of wires for a power output of only 150 kW) and Teatro Regio (in charge of implementation, maintenance, assembly, disassembly, service, etc).